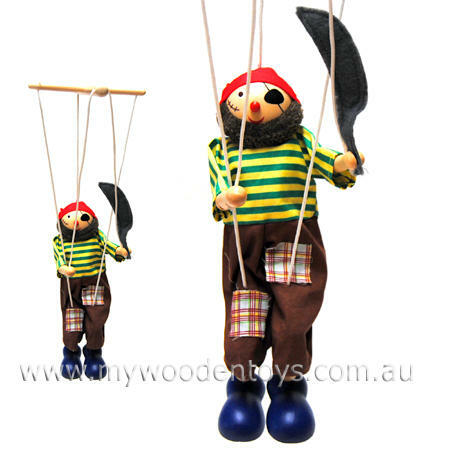 Puppet Marionette Pirate is a great traditional string puppet with a stripy shirt, patched pirate trousers and beard. With 5 strings this puppet is stable and easy to use and balances well on big blue feet. Beautifully made with jointed knees and hips this little Pirate will soon be dancing. He comes complete with a scar, head scarf and felt cutlass. The Pirate has 5 strings, 1 for the head, 2 for arms and 2 for legs. We like this because: "We were so happy to find this traditional toy at such a good price"